On 28th to 29th March 2018 Mongolia launched the Vision Zero campaign in the framework of the Safety First Forum 2018 (Figure 1). The complete Mongolian industry with the big mining industry in the first line is fully committed to the VISION ZERO Strategy of ISSA and to its 7 Golden Rules. There were more than 450 participants at the launch, which was organised with the support of the IVSS Mining Section. It took place in Erdenet City, a mining city of 80,000, and the Forum also marked the celebration of the Erdenet Mining Corporation’s 40th anniversary. 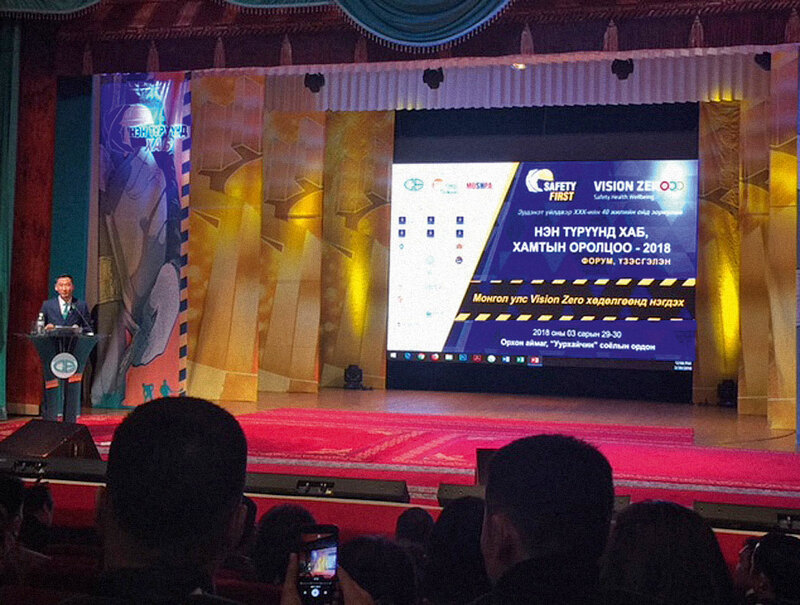 The Erdenet Mining Corporation is one of the six Mongolian companies and organisations that have joined -Vision Zero so far. The Forum was opened by Armando Torres, CEO of Oyu Tolgoi LLC (OT), Shinebaatar Bergzsuren, First Deputy Director of the Erdenet Mining Company (with 50.000 mining workers) and Ts. Natsagdorj, President of MOSHPA, the Mongolian Occupational Safety and Health Professional’s Association. Being present for the whole two days, they clearly demonstrated that personal leadership is the success factor number 1 for zero accidents, diseases and harm at work, and for its importance in running a good business. The safety performance of the Oyu Tolgoi (OT) LLC copper mine is the best in all of Rio Tinto though it is one of the youngest mines of the company which is located in Gobi desert. Torres declared his willingness to share the best practices of OT with other Mongolian companies and said that he very much supports the VISION ZERO movement and the excellent 7 Golden Rules because of their clearness. He assured his help in order to spread the VISION ZERO campaign across the world. On the occasion of the launch, two memoranda of cooperation were signed, one between Erdenet Mining Company and Oyu Tolgoi LLC and one between ISSA Mining and MOSHPA. MOSHPA presented a first draft of the VISION ZERO guide in Mongolian language which will be reviewed and approved by the ISSA.